A young adult biography of Frankenstein's profound young author, Mary Shelley, coinciding with the 200th anniversary of its publication, told through free verse and 300+ full-bleed illustrations. Dark, intense, and beautiful, this free-verse novel with over 300 pages of gorgeous black-and-white watercolor illustrations is a unique and unforgettable depiction of one of the greatest authors of all time. As I wind-up Women's History Month and transition to National Poetry Month in April, I am celebrating with Lita Judge's Mary's Monster: Love, Madness, and how Mary Shelley Created Frankenstein. I have been a huge fan of Lita's picture books and was excited to find out about her latest book, which is so very different from anything that she has done before. When I first learned that Mary Shelley wrote Frankenstein when she was essentially a teenager, I was amazed. Not only did she write a powerful book as a teenager but a young woman during a time period when women had very little choice. I wonder what Shelley would think if she knew that 200 years later her novel continues to be read and taught in classes all over the country. Judge reaches back into history to bring Mary Shelley to present day readers. Through the reading of Shelley's journal, and the work of Percy Bysshe Shelley, and the poetry of Lord Byron, along with a biography on Mary Wollstonecraft, Judge crafted an intimate look at Shelley's life. I loved that Judge choose to write this book as a collection of free verse poems accompanied by 300 pages of illustrations. 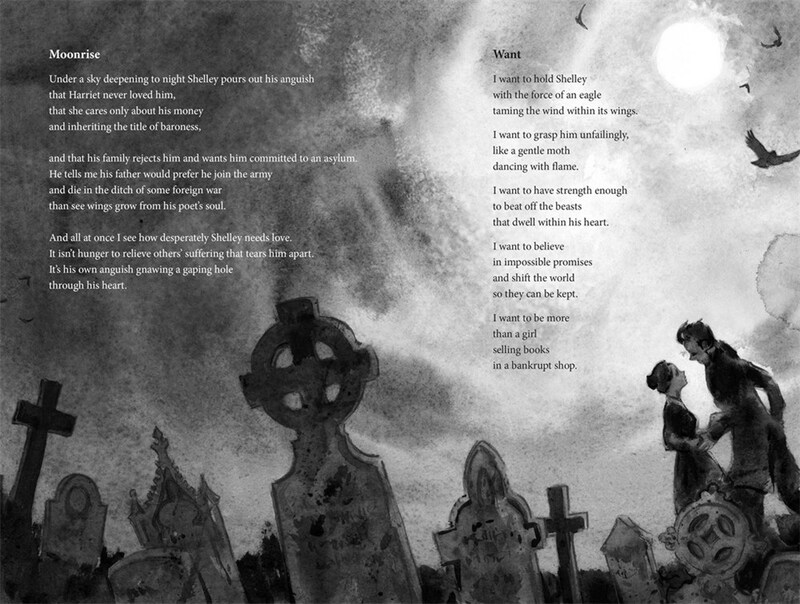 Thank you Lita for such a beautiful book to celebrate the life and work of Mary Shelley. And for an illustrated version of Mary Shelley's Frankenstein, I recommend Gris Grimmly's Frankenstein. A couple of years ago, I got to see the taped version of the National Theatre's (London) Adaptation of Frankenstein. I am hoping that some day they will release the video for more people to see. It was amazing. Thank you Cathy Mere and Mindy Robek for beginning and continuing to host the Nonfiction Picture Book 10 for 10. It is of course one of my favorite posts of the year. Last year, I posted my 10 favorite picture book biographies about 10 women who "nevertheless persisted". You can read it here. 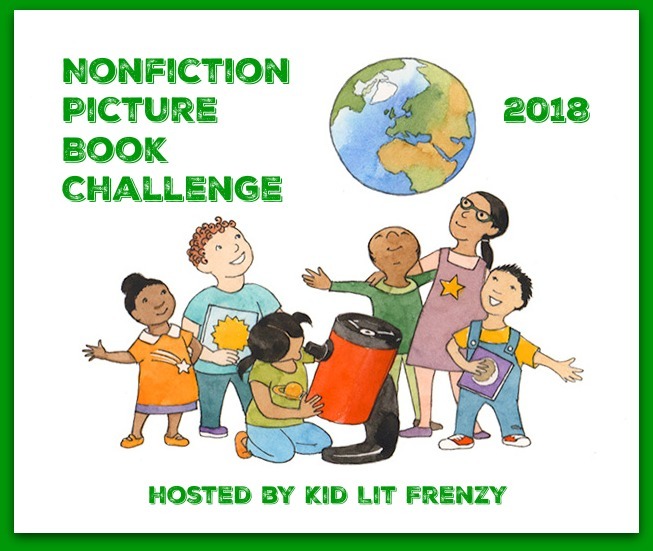 Where: All posts will be linked on the 2018 #nf10for10 page of our Picture Book 10 for 10 Google Community Site. Here is the link to the full post from Cathy for more information. The Great Leopard Rescue: Saving the Amur Leopards by Sandra Markle (Millbrook Press, 2016) - A book about leopards by Sandra Markle. How can this be anything but fabulous?! Moto and Me: My year as a Wildcat's Foster Mom by Suzi Eszterhas (Owlkids Books, 2017) - Well, I haven't ever fostered a wild cat but I did foster 5 kittens last year. Does that count? Abayomi The Brazilian Puma: The True Story of an Orphaned Cub by Darcy Pattison; Illustrated by Kitty Harvill (Mims House, 2014) - Another rescue story about a Brazilian Puma. Chasing Cheetahs: The Race to Save Africa's Fastest Cats by Sy Montgomery; Photographs by Nic Bishop (HMH Books for Young Readers, 2014) - I love the Scientists in the Field series, and I love Sy Montgomery's work. So much so that she made the list twice. Absolutely love this book. Cat Tales: True Stories of Kindness and Companionship with Kittens by Aline Alexander Newman, Mieshelle Nagelschneider (Foreword) (National Geographic, 2017) - If you ever think that cats don't bond with their owners, you may want to read this. It will certainly change your mind. All Cats Have Asperger Syndrome by Kathy Hoopmann (Jessica Kingsley Publishers, 2006) - A friend whose son has been diagnosed with Autism shared this book with me. She said her son really related to this book and the comparisons it made between cats and the traits of individuals on the autism spectrum. A Boy and a Jaguar by Alan Rabinowitz; Illustrated by Cátia Chien (HMH Books for Young Readers, 2014) - I love this book and was so excited to be on the Schneider Family Book Award jury when this book won a Schneider Award. Dogs and Cats by Steve Jenkins (HMH Books for Young Readers, 2007) - This book may be called Dogs and Cats but I think it should be called Cats and Dogs. I love how the book can be flipped over to read about cats and dogs. Saving the Ghost of the Mountain: An Expedition Among Snow Leopards in Mongolia by Sy Montgomery; Photographs by Nic Bishop (HMH Books for Young Readers, 2009) - As I mentioned earlier, Sy Montgomery made the list twice. Bookstore Cats by Brandon Schultz (Glitterati, 2017) - How can a book lover and a cat lover not love a book about cats who live in bookstores? This one features real life cats who have taken up residence in bookstores and tells their stories. In August, I will share my favorite fiction books about cats. Recently, the American Library Association held it's annual Midwinter Conference in Atlanta, Georgia. Various book award committees met at the beginning of the weekend to discuss books and award the best of the best with shiny medals. Though I managed to pick two of the Sibert books correctly, I was surprised to see that Some Writer! by Melissa Sweet did not win. I wonder if it was a casualty of time? I have no concrete evidence of this but six out of the nine winners listed below deal with significant historical events dealing with World War II, Civil Rights, Immigration, or biographies of presidents and other activists. Given our current political climate I wonder if readers are looking for answers in the past? Even if it is unintentional. The other thing I noted this year is that there is only one picture book on this list resulting in lots of reading for older readers. Regardless of the reasons behind the decisions, I would like to thank the Sibert Award Committee and the YALSA Nonfiction Committee on their hard work and selection of fabulous books. March Book Three by John Lewis, Andrew Aydin; Illustrated by Nate Powell (Top Shelf Productions. Linda Baie has won the Mock Sibert Giveaway. I assigned a number to each person who left a link with a Mock Sibert post. With the use of a random number generator, the number generated was how the winner was selected. I will be emailing Linda to work out details. Read an additional deleted scene at Fuse Eight/SLJ here. Before these men became legends, they met in 1907 at the Carlisle Indian Industrial School in Pennsylvania, where they forged one of the winningest teams in American football history. Called "the team that invented football," they took on the best opponents of their day, defeating much more privileged schools such as Harvard and the Army in a series of breathtakingly close calls, genius plays, and bone-crushing hard work. Undefeated: Jim Thorpe and the Carlisle Indian School Football Team is an astonishing underdog sports story—and more. It’s an unflinching look at the U.S. government’s violent persecution of Native Americans and the school that was designed to erase Indian cultures. Expertly told by three-time National Book Award finalist Steve Sheinkin, it’s the story of a group of young men who came together at that school, the overwhelming obstacles they faced both on and off the field, and their absolute refusal to accept defeat. [intro] One of the main things I needed to establish early on in Undefeated was the shockingly raucous and violent nature of early day football. This scene describes a famously nasty game between Harvard and Yale in 1894—we wound up cutting it because we get across the same points with Pop Warner’s experiences on the Cornell team. Everyone knew football was a violent game—but was it becoming too violent? The game that brought this question to national attention was the 1894 edition of the annual Harvard-Yale showdown, essentially the Super Bowl of early-day American football. “It was a game in which an unusual amount of bad blood and foul playing was shown,” noted the New York Times. Yale captain Frank Hinkey set the tone before the players even took the field. In his team’s hotel the night before the game, Hinkey urged teammates to intimidate the Harvard boys by ignoring their fair catch signals on punts—the signal meant the returner couldn’t advance the ball, but defenders couldn’t hit him. The next day, at Hampden Park in Springfield, Massachusetts, 25,000 fans roared as the teams as they took the field. Some waved banners of Yale blue; most waved Harvard crimson. Police officers had made the trip from Boston to keep the peace between rival student bodies. But it was action on the field that needed policing. When Yale punted early in the game, the Harvard returner waved for a fair catch. Frank Hinkey launched himself, knee raised, into the returner as the ball arrived, snapping the man’s collarbone. Yale was flagged for roughness. Harvard fans called for revenge. A few plays later, a Crimson lineman reared back and punched Hinkey in the jaw. The battle was on. And keep in mind, the players were not wearing helmets. Or any other protective equipment. A Harvard man jammed his finger into a Yale player’s eye, causing blood to flow. Yale’s Fred Murphy broke a Harvard player’s nose with his fist. Harvard then gang tackled Murphy, working him over on the ground. Murphy got up and stayed in the game, but was so dizzy that between plays teammates had to guide him back to his position and point him in the direction of the opposing team. Eventually, he staggered to the sidelines, lost consciousness, and lay on the sideline as play resumed. Seven of the twenty-two starters had to be carried off the field. Five, including Fred Murphy, were hospitalized. Two were ejected for excessive roughness. After the game, a 12-4 Yale victory, each school blamed the other. Horrified by what became known as the “Springfield Massacre,” and the “Hampden Park Blood Bath,” officials at Harvard and Yale agreed to cancel their heated football rivalry. But it didn’t last. Two years later, they started playing again. Steve Sheinkin is the award-winning author of fast-paced, cinematic nonfiction histories for young readers. The Port Chicago 50: Disaster, Mutiny, and the Fight for Civil Rights, was a National Book Award finalist and received the 2014 Boston Globe/Horn Book Award for Nonfiction. The Notorious Benedict Arnold: A True Story of Adventure, Heroism & Treachery, won both the Boston Globe/Horn Book Award and the YALSA award for Excellence in Nonfiction for Young Adults. Bomb: The Race to Build-and Steal-the World's Most Dangerous Weapon was a Newbery Honor Book, a National Book Award Finalist, and winner of the Sibert Award and YALSA Award for Excellence in Nonfiction for Young Adults. Most Dangerous: Daniel Ellsberg and the Secret History of the Vietnam War was a National Book Award finalist and a YALSA Excellence in Nonfiction Award finalist. Sheinkin lives in Saratoga Springs, New York, with his wife and two children. Found Steve on his blog or twitter.